In Part 1 I explored the notion of ‘progress’, an increasing appetite to embrace sustainability considerations, and the benefits of it. Part 2 solves the mystery of what all of this has got to do with going round in circles, and offers some thoughts on how best to start doing it. I realise you may still be puzzled about where going round in circles comes into this?! Well, beyond doing more with less (1st principle of natural capitalism), doing things differently (2nd & 3rd principles) and reinvesting in natural resources (4th principle), there is something else we can do: ensuring that what ever resources we use for our products and services, we keep them ‘in use’ for as long as ever possible. Hence we are moving from a linear use of resources — cradle to grave, to a circular one -‘cradle to cradle’. This involves designing things so that they last, designing things in a way that individual components or materials can be recycled and reused. While the phrase “cradle to cradle” itself was coined by Walter R. Stahel in the 1970s, it was the work by William McDonough & Michael Braungart in the 1990s that led to its widespread use. Here the link to an introductory video. When taking the concept from the product level to the level of the economy, the term used today is ‘Circular economy’. 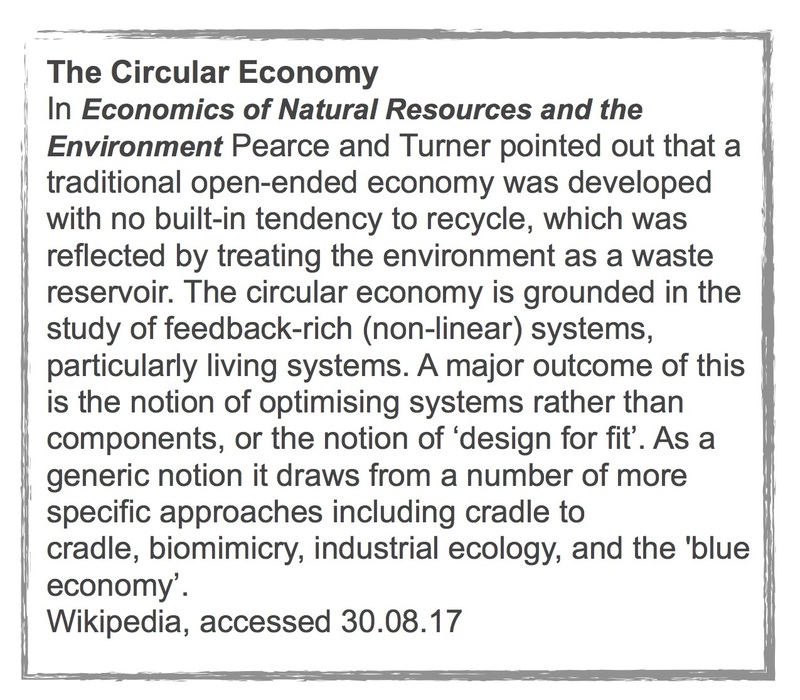 This term was coined by British environmental economists David W Pearce and R. Kerry Turner in 1989, and is at the heart of, and was popularised by, the Ellen MacArthur Foundation, established in 2010 with the aim of accelerating the transition to the circular economy. Have a look at their website, it is full of useful resources and information. Someone else leading this field, whom I have referred to in my last mailout, is Kate Rathorn. She has taken the concept of the circular economy one step further and introduced an upper limit, the ‘ecological ceiling’ above which we start depleting natures resources beyond repair, and a lower limit, the ‘societal foundation’ which is defined by how many resources humanity needs to live well. For an explanation that is much more eloquent than mine, visit Kate’s website. If you want to delve in deeper, Kate’s recently published book is the place to go. A lovely example of an circular economy inspired start-ups is Cirkel, set up by members of the ILF Wider Community Nidhi Garg & Deepak Goel. You can read an interview with them and the story behind Cirkel here. You may also want to think about changing to 3BL reporting – 3BL stands for Triple Bottom Line, meaning an assessment of overall business performance based on three important areas: Profit, People and Planet (not only profit…). The concept was introduced by British sustainability consultant John Elkington back in 1994 and I found this introduction and overview by Timothy F. Slaper and Tanya J. Hall, members of Kelley School of Business’ faculty, quite useful. What might help speed along the journey? I am always a huge believer in inspiration. The good news is that we are definitely not starting from scratch, there is already a lot out there. Here a few examples that are inspiring me. Putting your money where your mouth is is one approach suggested by Seymour Burchman & Barry Sullivan in their Harvard Business Review article of August this year, It’s Time to Tie Executive Compensation to Sustainability. Knowing that there are alternatives to what is currently in place also helps – a great place to start is the film ‘Demain’ (you might also find it under its English title, ‘Tomorrow’). As it says in the film’s description, “Climate is changing. Instead of showing all the worst that can happen, this documentary focuses on the people suggesting solutions and their actions.” If you think what the movie industry has generally to offer in terms of visions of the future, it is all doom and gloom and disaster… Demain offers examples from a number of different fields on how things can be done differently: ‘agriculture’, ‘energy’ ‘economy’, ‘democracy’ and ‘education’. And it has very beautiful music by Fredrika Stahl to boot. IndeedI can only highly recommend it. The intention of the film, to showcase a positive outlook on the future, takes me back to 2000. I was running a networking initiative on behalf of London Business School and was preparing our first anniversary celebration under the theme ‘Future 2020’, to be held at the Millennium Dome in the presence of the then Minister for Science and Innovation, Lord David Sainsbury, and management thinker and author Charles Handy. As part of my preparation I sought out books on the future – and to my dismay almost all of them painted such a dark, unhappy and sometimes outright scary picture, only one or two offered a positive outlook. Yet future is not something that happens to us. It is shaped by the decisions we make today, the plans we put into action, – and by the visions we hold when making these decisions. It seems that what ever humanity can image it can make reality, the good, the bad, and the ugly. I believe that dark visions trigger fear, mistrust and the desire to defend, whereas positive futures inspire, give confidence, and open up the mind to possibility and opportunity. If you are interested in the report I rote at the time, here it is. Something that has just dropped into my inbox is a free online event showcasing inspirational interviews around sustainability, organised by Sophie Wisburn. Interviewees include Unilever’s CEO Paul Polman and Virginie Helias, the Global VP of Sustainability at Procter & Gamble – and many more. Have a look at the website, and sign-up! Perhaps for some of us to get our heads around the concept of sustainability, natural capitalism, systemic thinking, we need to go back to school! Though this also requires a different attitude and approach to teaching, as the IMB study: Education Lags in Preparing Students for Globalization and Sustainability points out. Below a few programs and courses that have crossed my path – I would love to hear from you if you are aware of any great ones! As I have the feeling that as a first step we need to understand better how to influence and change systems – perhaps joining a course at the School of Systems Change might help? You can watch a video about it here. Then there is the One Planet MBA, originally developed in collaboration with the WWF and based at the University of Exeter Busienss School. Or perhaps online is more your thing? Cambridge have developed a short online course on sustainability management that covers everything from international regulations to technological disruption.